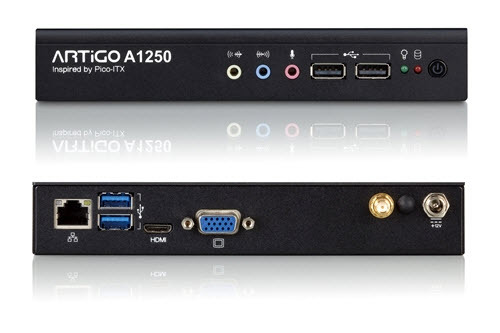 The smallest x86 quad core based system available, featuring 3D stereoscopic and HD video support for an immersive multimedia experience in an ultra low profile, compact design. The VIA ARTiGO A1250 is an ultra slim system for those seeking a compact solution without sacrificing computing power. . The VIA ARTiGO A1250 is the slimmest full featured quad core system on the market today with an ultra low-profile design measuring a mere 17.7cm x 12.5cm x 3.0cm (W X D X H), a full ten percent smaller than the VIA ARTiGO A1150 series. This slim systems fits easily into any environment, whether it is behind a monitor or on the wall with a 10 x 10 cm VESA mount or placed alongside other home media devices. It is suitable for a myriad of applications in the home or office, including home server, home automation, hotel automation, media streaming, digital signage, surveilLANce as well as for medical and healthcare applications. For system developers, VIA offers third party software security through our unique hardware/software design.